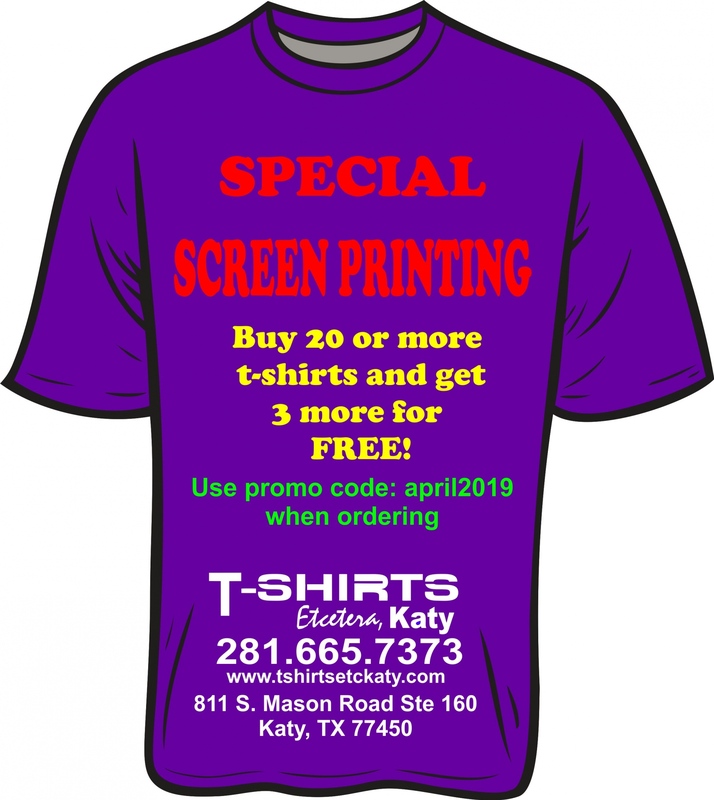 Get 15% off any advertisement in Fulshear Living magazine. 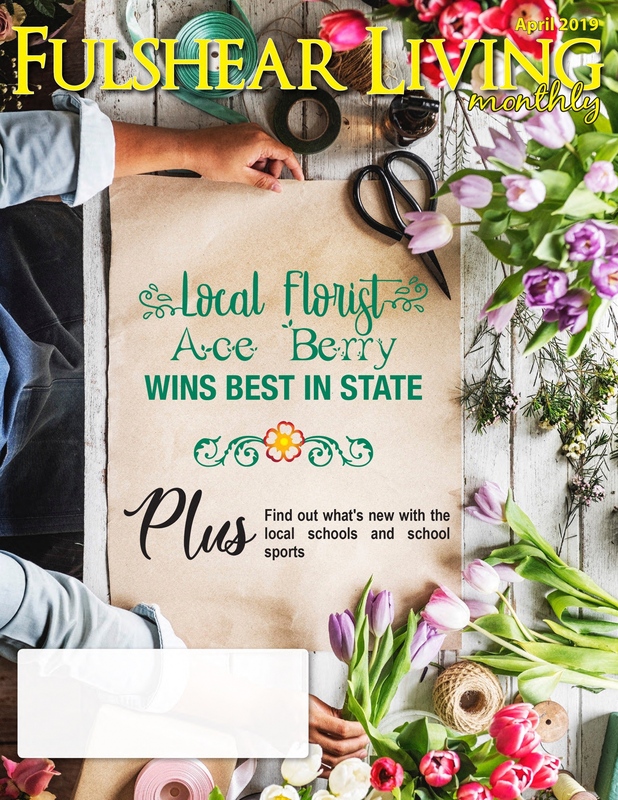 Fulshear Living magazine is a directly-mailed product free to families and businesses. 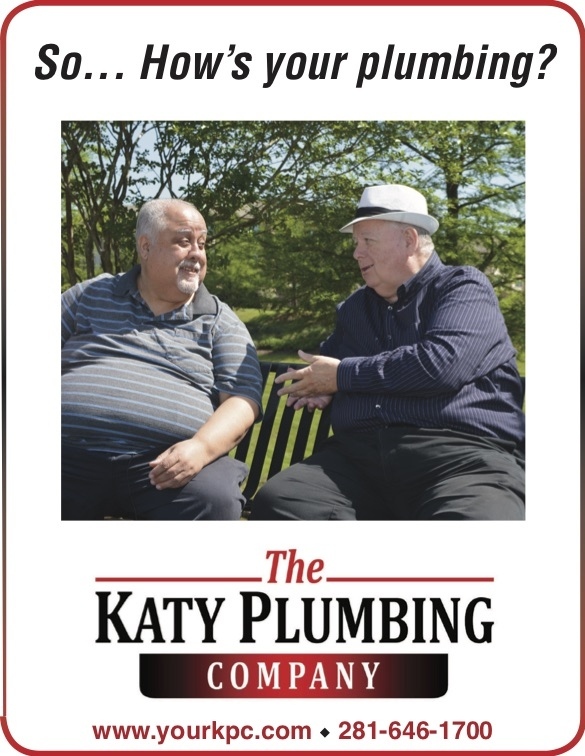 We distribute 7,500 every month reaching homes in Fulshear, Weston Lakes, Cinco Ranch, Seven Meadows, Simonton and others. We carry this magazine on our website as well. Wednesday, December 5 8:00 a.m.
Seabourne Creek Nature Park, 3831 Texas 36 South, Rosenberg. All ages and levels of birders are welcome; meet in the parking lot at 8 a.m. to sign in. Binoculars and weather-appropriate clothing and footwear are recommended. 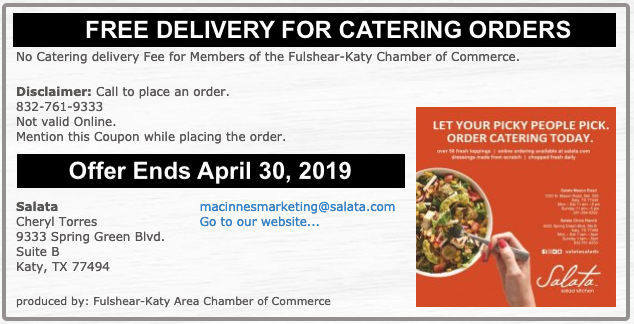 SALATA OFFERING FREE DELIVERY FOR CATERING ORDERS! Looking for a family vacation this Summer? the Azul Hotels by Karisma are 5-star hotels with awesome accommodations, food and beaches in the Riviera Maya, Mexico & Negril, Jamaica. 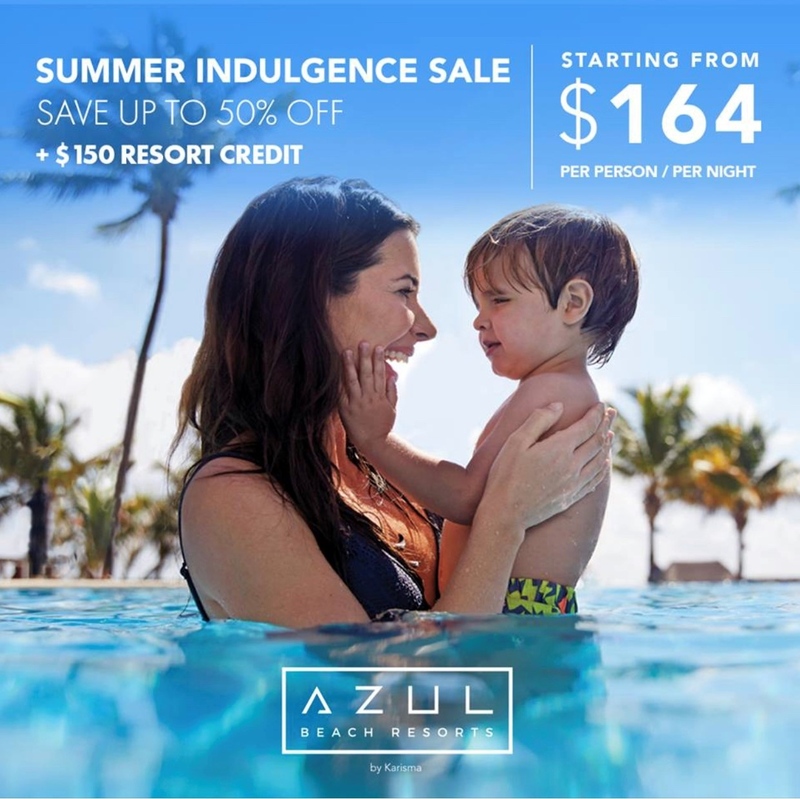 All Inclusive deals start at $164 per person / per night. Planning a Summer Getaway? 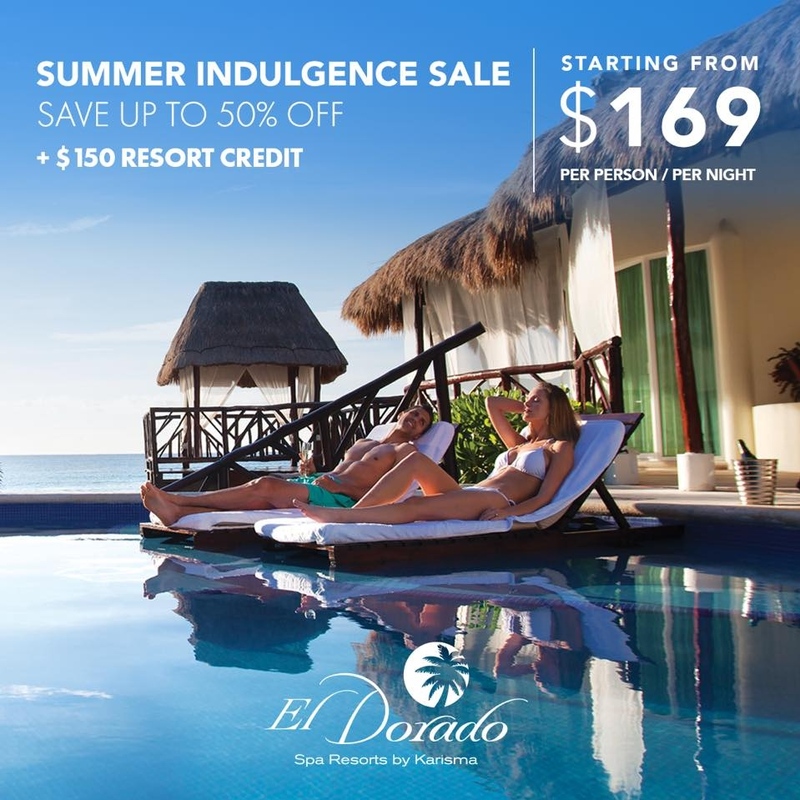 the El Dorado Resorts in Riviera Maya, Mexico have amazing deals! save up to 50% off at the Adults-only AAA-4 Diamond hotels in Riviera Maya. 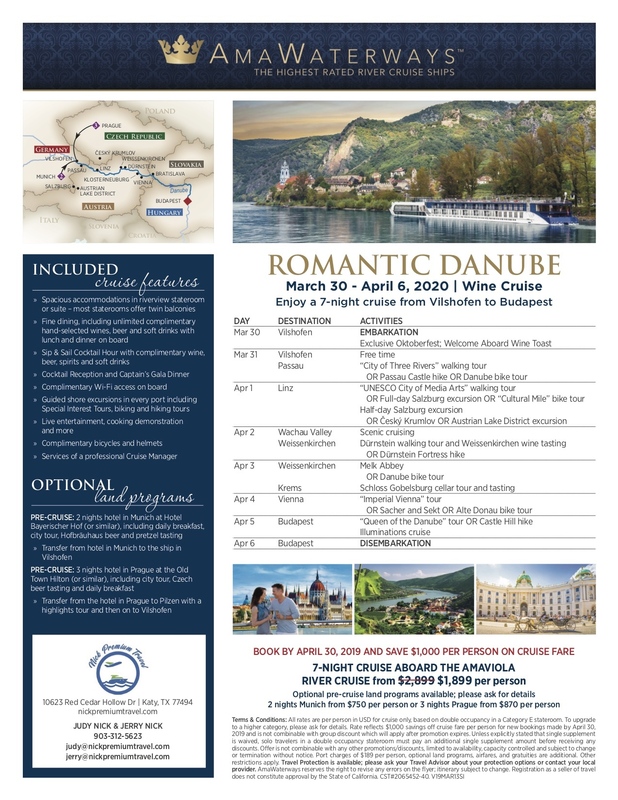 First class accommodations, exquisite cuisine, amazing facilities....you will be in heaven! 5. You are never alone – We are available before, during and after your trip – anytime! 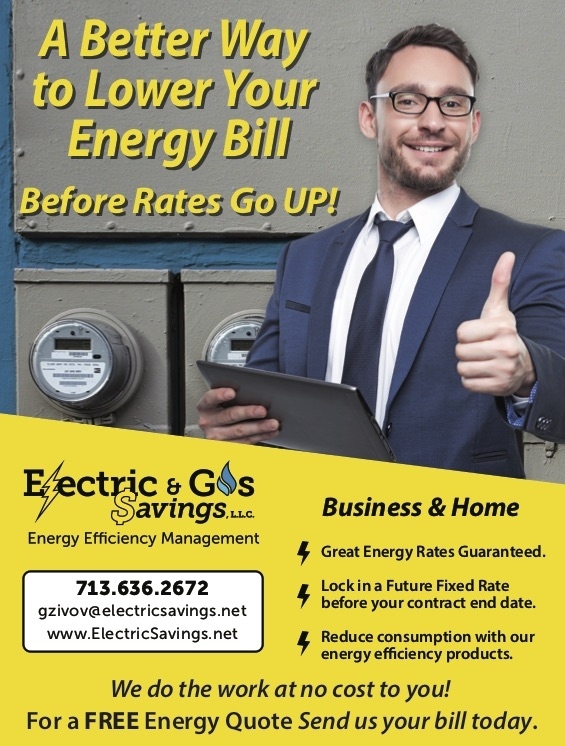 $37.50 OFF OF ANY SERVICE!! 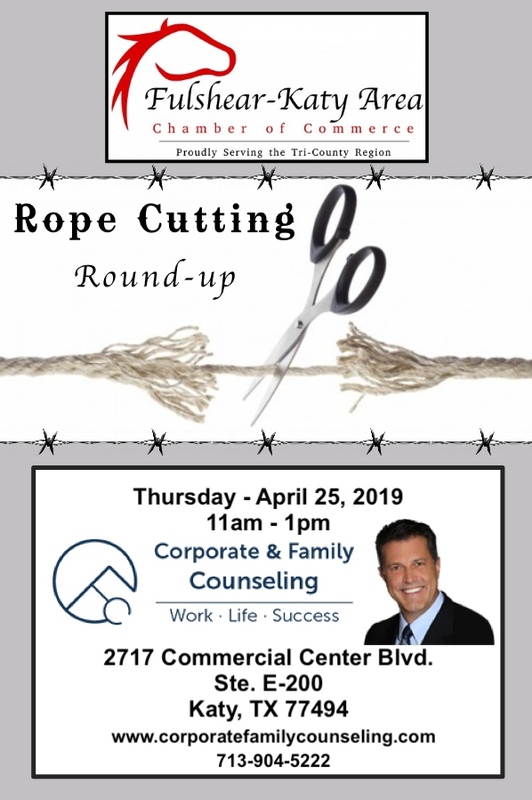 Saturday, April 27, 2019, from 10:00 A.M. – 2:00 P.M.
@ Cinco Ranch Branch Library - 2620 Commercial Center Blvd. The 2019 Fort Bend Arts Fest is back and packed with kid-friendly, creative, interactive fun! Check out over 300 visual art and essay pieces created by emerging artists from local schools in Katy ISD, Lamar CISD & Fort Bend ISD, a children's storybook character parade through the LaCenterra at Cinco Ranch retail center, over 100 kid-friendly vendors, local summer camp & activities expo, food trucks, live entertainment, goat yoga, a helicopter fly-over, laser tag, a gaming truck, free caricatures and more. 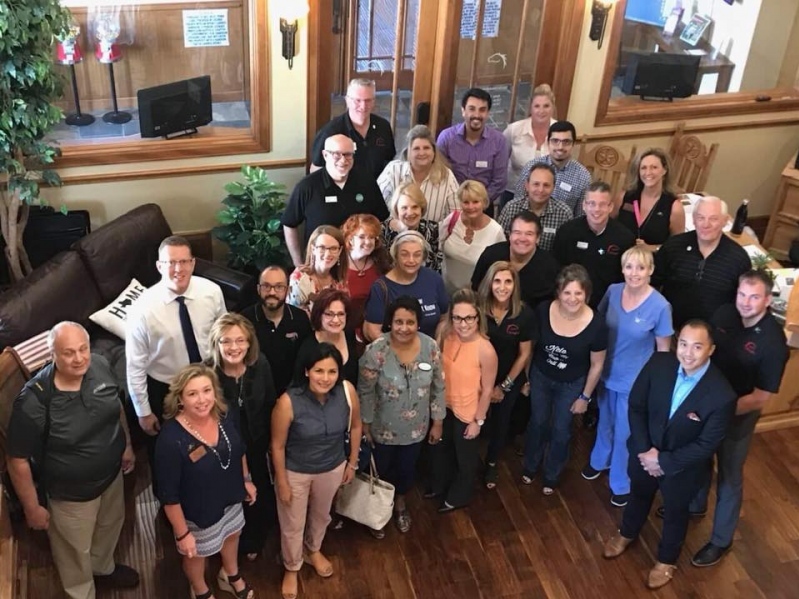 Sponsors of the Fort Bend Arts Festival have the unique opportunity to reach a diversified audience including K-12 students and their parents in Fort Bend ISD, Katy ISD, and Lamar Consolidated ISD schools, local business owners and elected officials, and community leaders. On average 40 public schools, 70 teachers, and 350 students participate in the annual literary and fine arts competition, and the actual festival has grown to attract over 5500 residents living in the Katy, Fulshear, Richmond and West Houston areas. Hundreds of community members also visit the Fort Bend County Cinco Ranch Branch library in the two weeks surrounding the festival to view artwork and essays submitted as part of the literary and fine arts competition. Our partnership with Fort Bend Charities, All about Katy, Fort Bend County Libraries, and the generosity of our committee members allow us to ensure that the majority of our sponsorship donations go directly to the student artists, teachers and school’s participating in the Fort Bend Arts Fest Literary and Fine Arts competition. For more information visit www.fortbendartsfest.com/sponsor or contact emily.hodges@fortbendcountytx.gov. Family Fund Day of Acceptance, Awareness and Inclusion for Kids with Autism and their Families. 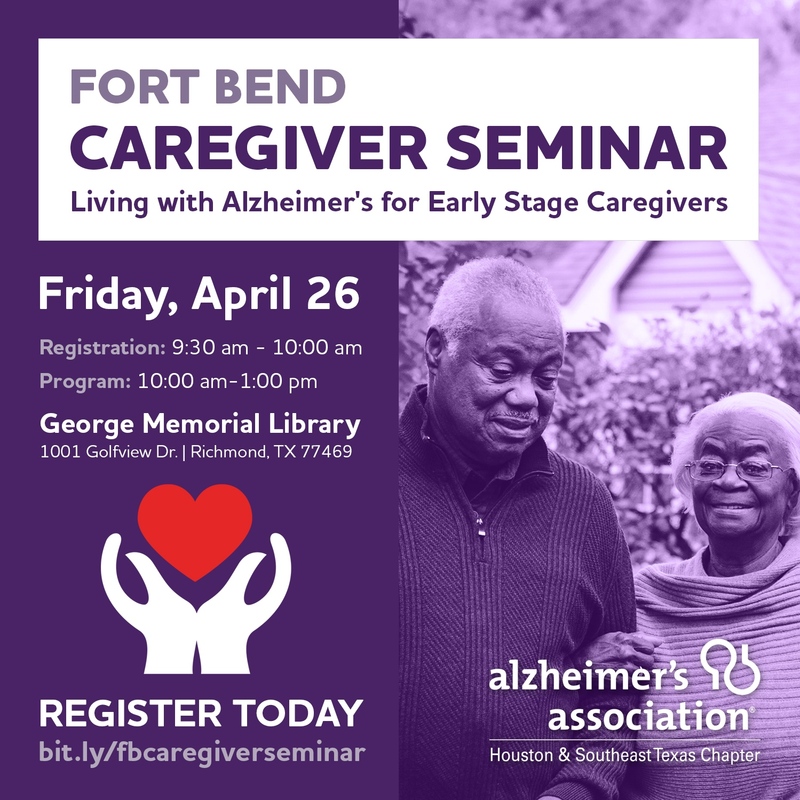 Please join County Judge KP George and all 18 City Mayors in Fort Bend County for this AUSOME event. 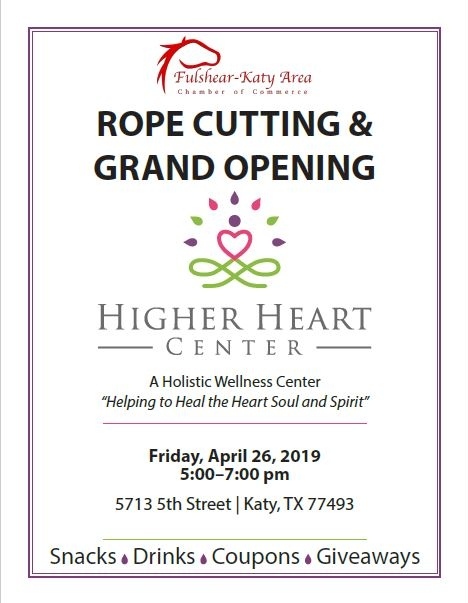 Join us as we cut the ribbon on our new location at Kingsland & Grand Parkway! May 1st, 2019 at 8:30am. 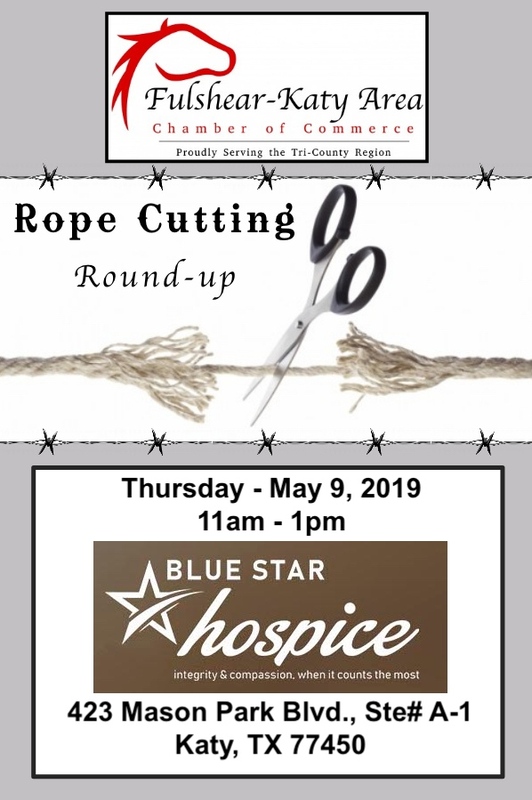 Come and help us open our new store with Good Buys for a Great Cause! 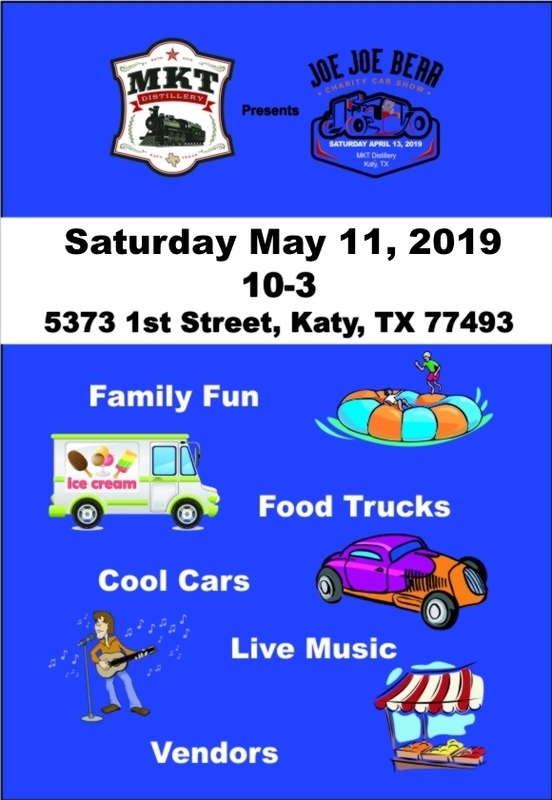 The KCM Resale Stores and Donation Center support the work of Katy Christian Ministries, a 501(c)3 Social Services Nonprofit that is dedicated to "Transforming lives through God's grace and the generosity of the community" since 1984. Learn more about us at www.ktcm.org. Our services are 100% free of charge to families in need. 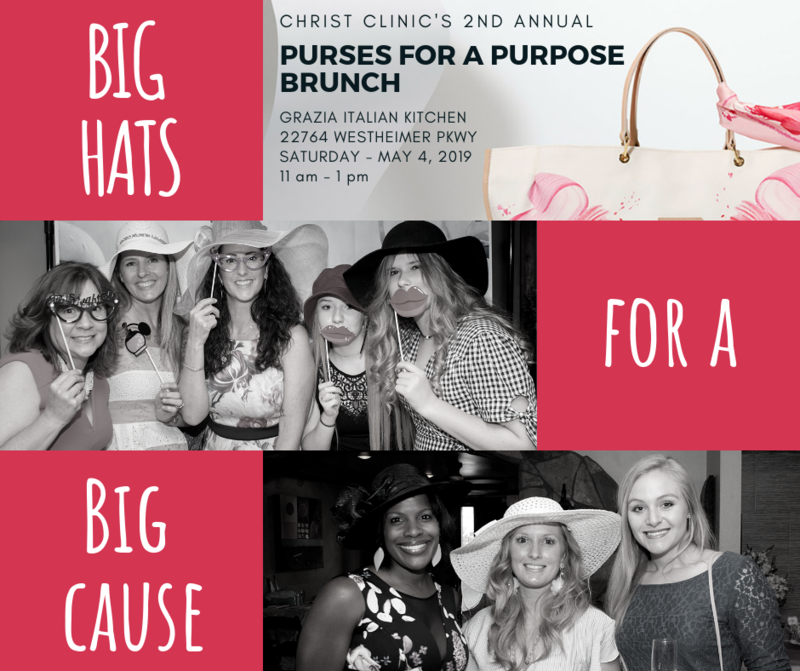 WEAR A BIG HAT FOR A BIG CAUSE! We understand that healthcare is expensive, complicated and have its own set of obstacles. Charity medical clinics like Christ Clinic offer a very valuable service to the community. We are available. We are accessible. We are affordable. Christ Clinic exists to help bridge the gap between health inequities and lasting wellness for the uninsured. 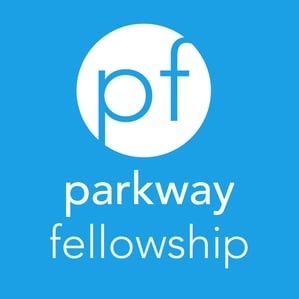 Please mark your calendars for Sunday, May 5, 2019! 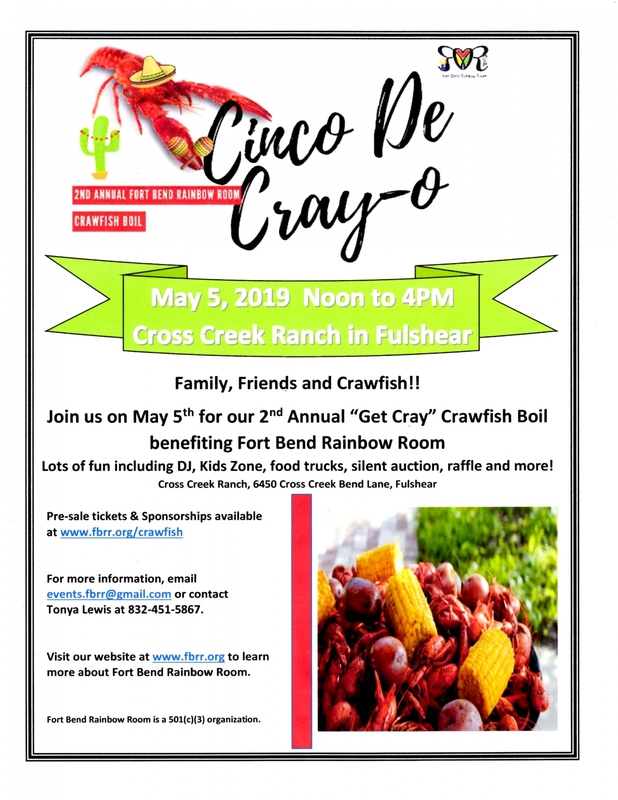 We are inviting you, your friends, and colleagues to join us for our 2nd Annual “Get Cray” Crawfish Boil, noon to 4PM, benefiting the Fort Bend Rainbow Room at Cross Creek Ranch (6450 Cross Creek Bend Lane) in Fulshear. 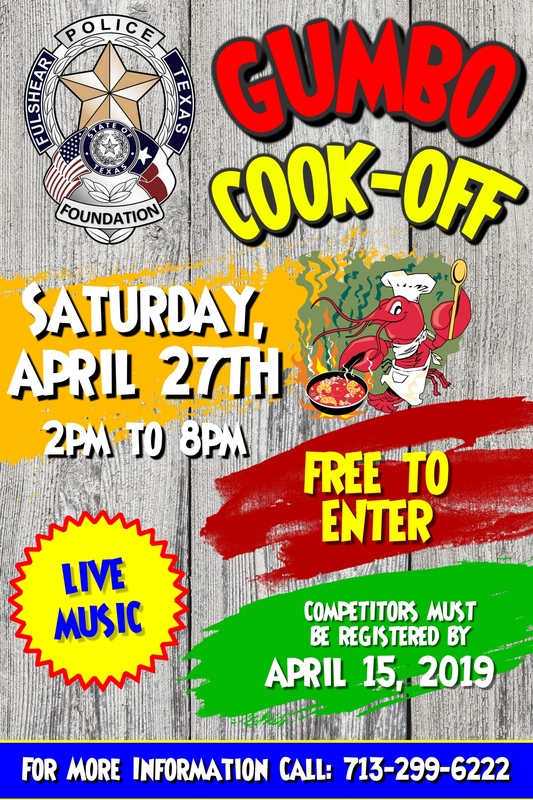 This is a family friendly event with plenty of food, fun, and live entertainment! 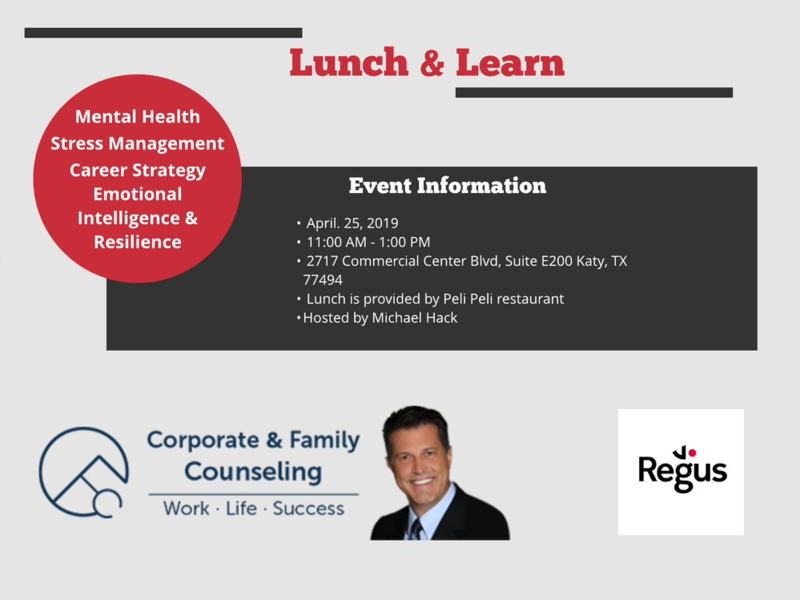 The Rainbow Room is an in-house emergency resource center established to meet the critical needs of abused and/or neglected children and adults in crisis being served by the Texas Department of Family and Protective Services in Fort Bend County. The Rainbow Room makes available to the caseworkers immediate access to provide everyday essentials to children and families when they are the most vulnerable. 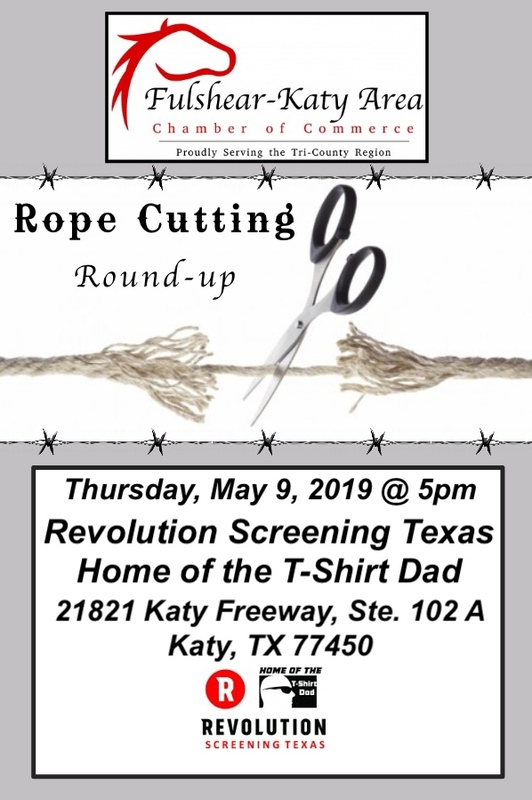 Proceeds received from this event will help fund the most basic needs such as clothing, baby formula, school supplies, toiletries, car seats, beds and much more. 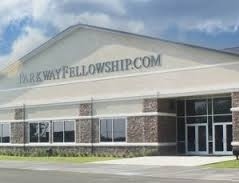 For more information, please visit our website at www.fbrr.org. Board of Directors Monthly Meeting - participants include Fulshear-Katy Area Board of Directors, Executive Director and Advisory Board. Adults can get in the game too! Take time out to enjoy some sporting activities for yourself with this Adult (18+) league from ONE Sports Nation. Register as a Free Agent to join a team and have some fun. Good Sportsmanship, camaraderie and fun are the focus for the Adult League. 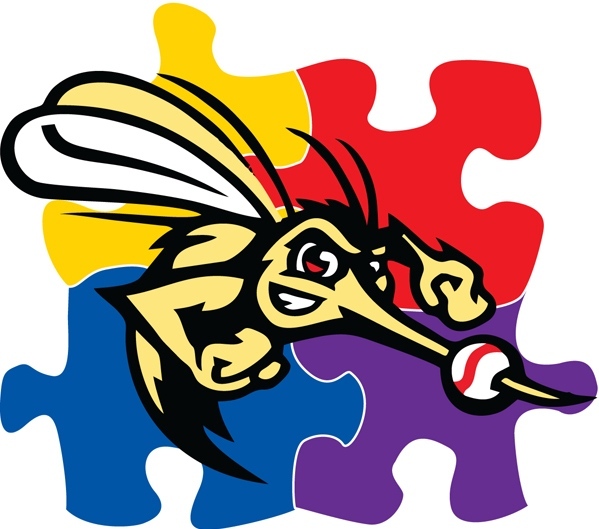 Teams provide their own team apparel and play a modified season with Tournament Play. "Guide to the Markets and Global Market Update"
Dustin M. Reid, CIMA®, Vice President, is a Client Advisor within J.P. Morgan’s Asset Management Division. 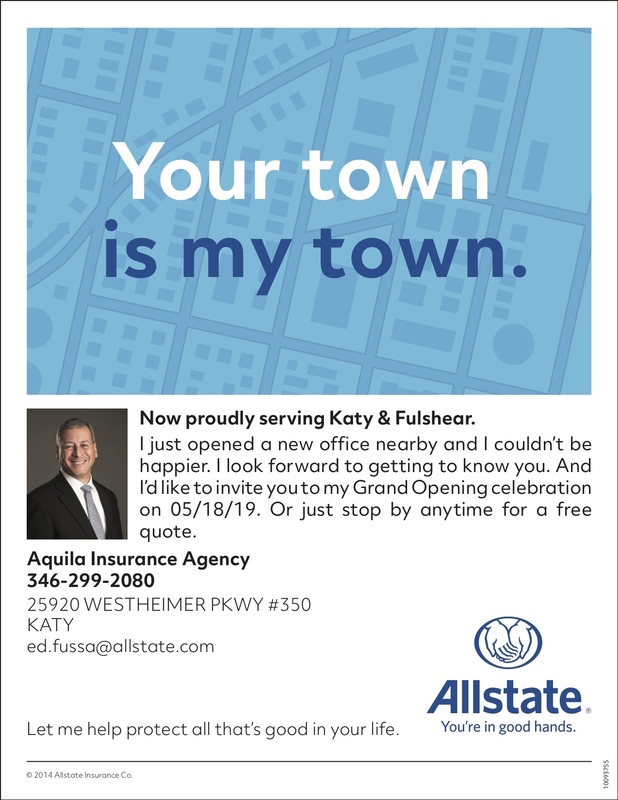 In this role, Dustin is responsible for delivering timely market and economic insight to financial advisors throughout the Metro Houston area. 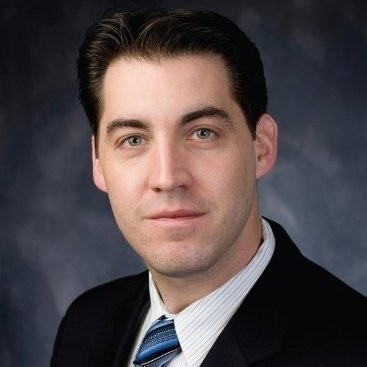 Dustin has 19 years industry experience and joined J. P. Morgan in 2014. He is a Certified Investment Management Analyst. He is Series 6, 63, 65, and 7 Licensed. 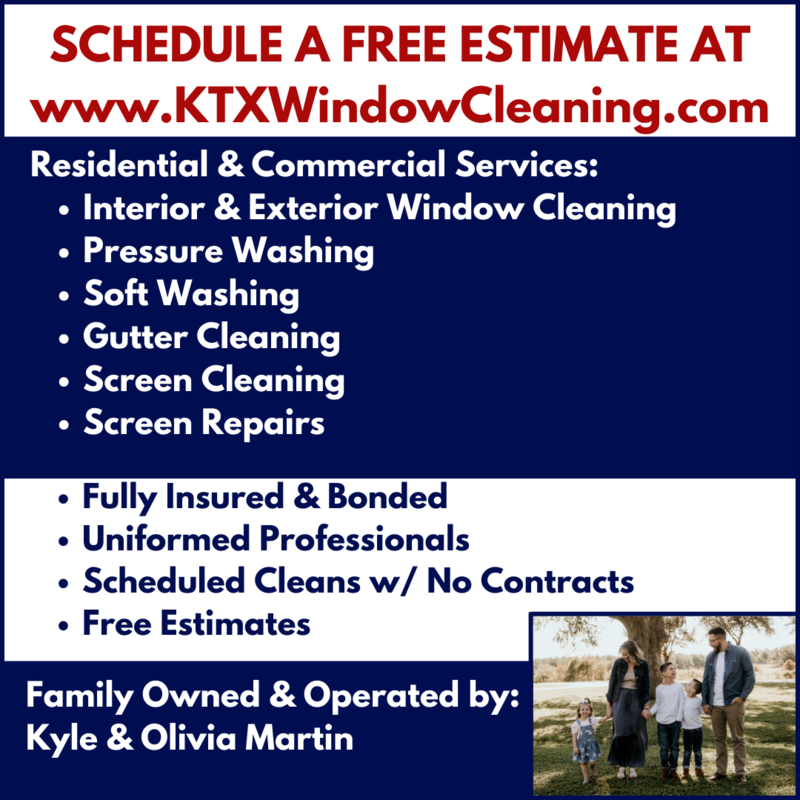 Originally from Massachusetts, Dustin and his wife Hannah reside in Houston with their two children Sienna and Oliver. A charity car show benefiting the Joe Joe Bear Foundation. Joe Joe Bear provides children with a life threatening illness a teddy bear and also educational resources for the parents and care giver. Sponsorships and vendor space available. We still have space for cars and motor cycles. A day of fun for the entire family. 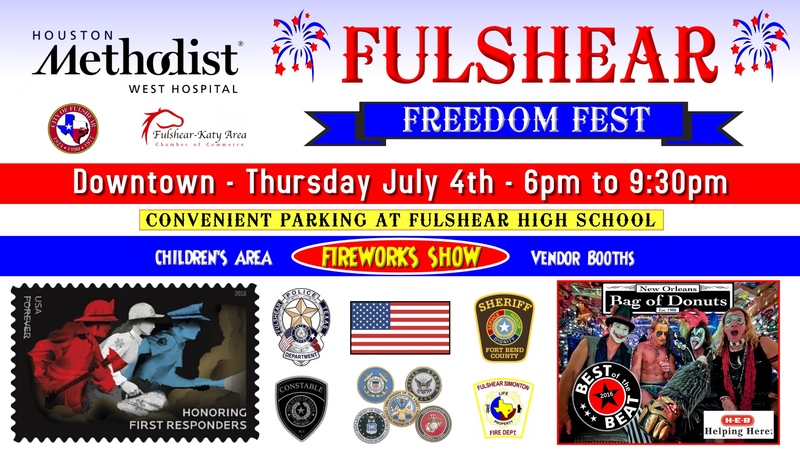 Food trucks, vendor booths, live music, air bounce and so much more. 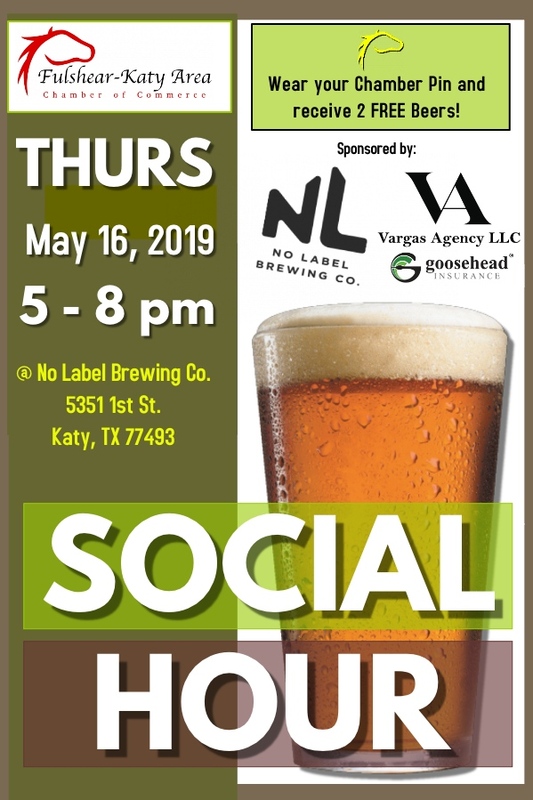 Come enjoy #networking with some of Katy's wonderful #business owners 3rd Tuesday of each month. Most people know that people do business with people that they know, like and trust! Come and get to know us...we're like family! Lots of business to be generated with our wonderful group of members. Meet new folks to grow your business to the next level. Bring a lot of business cards. 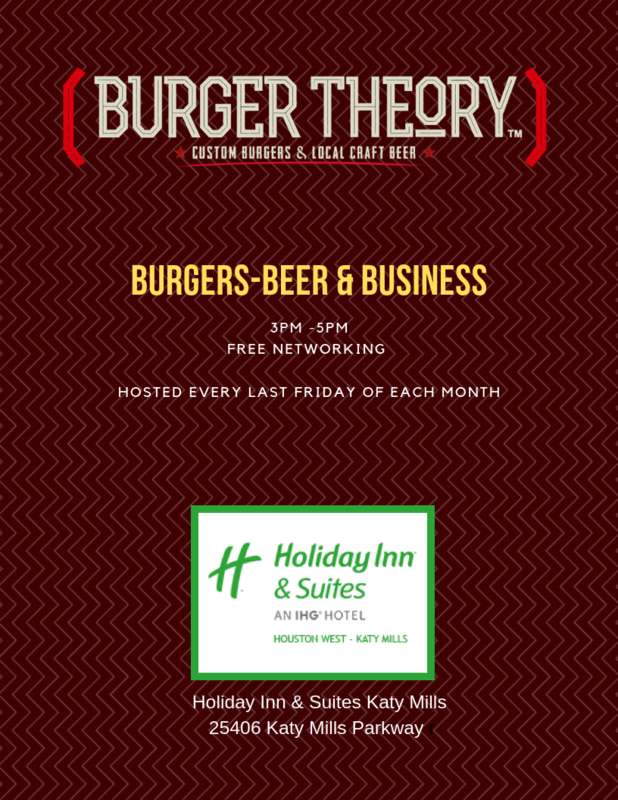 Donate a door prize and promote your business. Host: #NewellCheatheam.